On Monday, March 19th we had a visit with Dr. Loukas. During our visit he showed us the CT scans from when Maggie was first in the hospital (shown below labeled “Jan 2007”). Thankfully he took time to specifically point out the tumors in the scan (because it’s all just a bunch of black and white spots to us!) But after he pointed them out it was pretty obvious that her liver had a lot of tumors. 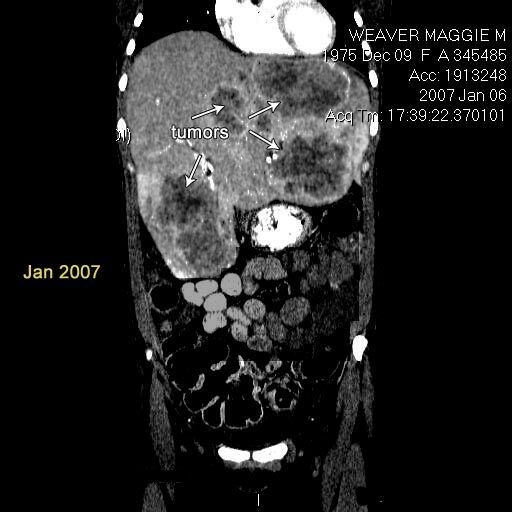 Next he showed us the CT scans from Thursday, March 15 (shown below and labeled, surprisingly, “March 2007”) and it was OBVIOUS that the tumors had shrunk considerably. It was fantastic. Chris nearly shed a tear. Please note that Maggie’s treatment success does not change her prognosis. It merely provides for a better quality of life and it’s our hope that it also provides opportunities for other treatments. Chris’s Caveat: These two images are not the specific images that the doctor showed us. Chris picked these two out of more than 900 slides. Despite his sudden immersion in medical studies since January 5, he still really has no clue what he’s doing or how to read CT scans so take these images with a little skepticism. Someone with proper training would no doubt pick different slides. Oh, and we added the arrows pointing to the tumors to help you see what the doctor pointed out to us. Maggie doesn’t actually have arrows inside her body. Remember that these slides are not XRays. They are each one slide of a set of CT scans. XRays would show all of the body in one slide (whole bones, spine, organs, etc.) CT scans are more precise because they dissect the body into thin, isolated, lateral sections. Think of the CT as a tool that slices Maggie up into long, thin strips much like a potato chip slicer produces potato chips. What you are seeing in these images is one “potato chip” or, more appropriately labeled, one “Maggie chip” minus the deep frying and salt. These specific images are pictures of very thin strips of a section of Maggie’s torso that begins at her heart/middle of chest and extends to her pelvic region. The white ball on top of the images is her large, loving heart. 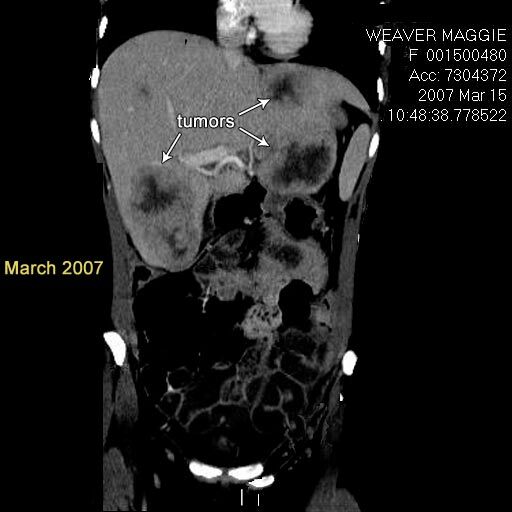 Her liver is the lighter blob in the upper-center of the picture strategically labeled “tumors”. The super white dots and dashes that partially define the circumference of the images are bones. The upper white dots on opposite sides of the liver are bones in her rib cage. The lower dots (one on each side of her intestines) and two lower-center dashes are of slices of her pelvic bone. The outside of the image roughly shows the shape of her body. Notice how the shape of her body in the image from January shows her torso swollen and distended. This is due to the liver pressing the internal organs down into her pelvic area. The scan from March shows a more natural “female” curve shape because the liver has shrunk back to a more normal size. Her liver has shrunk roughly 66% from the size in January. Yes, it’s very difficult to see 3-dimensional changes in a 2-dimensional space but trust us; the overall size of the liver has decreased dramatically. It’s now back to nearly normal size. It was 300% larger than a normal liver. For you math-challenged individuals compare an apple with a cantaloupe and you’ll get a rough idea that also tastes good. The liver should appear uniform in color and texture. The top-left of the liver in the March slide shows a good example of how healthy appears on a CT. Notice it’s light colored and uniform in texture (except for that small gray dot in the middle, which is another small tumor.) The January liver shows the big ol’ dark blobs. Those are masses of tumors. Disregard the graininess of the January image. That doesn’t have any medical significance and is likely a function of the machine used to capture the CT scans, much like taking a picture of a beautiful model using the crappy digital camera on your cel phone would turn out grainy. Pingback: The Great Cancer Adventure » Maggie’s tumors are dying! !